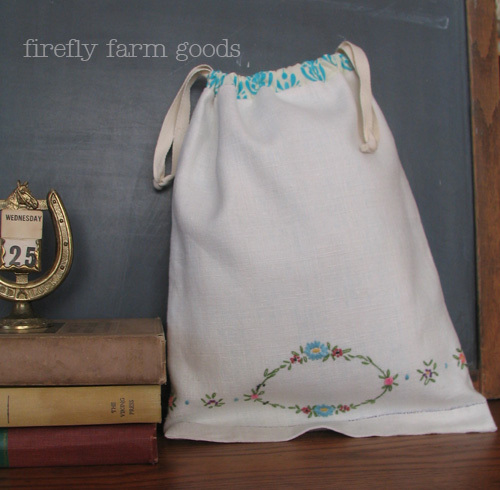 Pouch is made from vintage, embroidered linen; back is plain white linen. Lined with a blue & white print cotton. Measures approximately 11 inches wide x 14.5 inches tall. These drawstring pouches are each unique, a combination of new fabrics, knitting, embroidery, and recycled flea market textiles. They are all fully lined with the same fabric as the casing at the top of the bag, so there is no need to worry about anything poking through the knitted bottom.